Water sloshes back and forth over the brand-new, stylish Ottoman floor tiles. In the Israeli manner, squeegees are doing the hard work of mopping, ultimately bringing waves of dirty water out the door. It’s evening already, and Devorah Levine Katz and her employees at Pat BaMelach bakery should be winding down after a long day of work in their newly opened second location, but a burst pipe resulting in a flood augurs some kind of divine initiation. In Efrat, the largest town in Gush Etzion, inside the West Bank, the Katzes—Devorah and her husband, David—feel like they have moved into a mini version of Manhattan. Their first outpost of Pat BaMelach—a bread bakery specializing in hand-crafted sourdoughs—on Kibbutz Rosh Tzurim, in a rural area of Gush Etzion, is a tiny space compared to the expansive one they are now sweeping clean. In another room, David, a rabbi and former teacher turned artisan baker, is preparing the dough for the next day. The walls here are filled with artistic infographics on bread and Judaism, and how they are intrinsically linked through holidays as well as ancient and modern culture. The murals remind visitors that harvest holidays are more about wheat than the fruits and vegetables we often imagine. It is refreshing in a world that has turned increasingly gluten free—as if fresh bread were something to be feared. People have been eating sourdough for millennia. In fact, it is the original bread. Our modern society, obsessed with mass production and preservatives, has created instant yeast and packaged bread that is far removed from the wild-yeasted, deep golden and crusty loaves that Katz pulls from his ovens. Originally just a hobby, David used to bake furiously on Thursday evenings on a wood-fired brick oven in his backyard. He would then place his loaves on a table in the front yard next to a tip jar for passersby. In addition to the two bakeries, the Katzes—who made aliyah 20 years ago—offer hands-on baking workshops. Among their most popular workshops is one on soft yeasted pretzels. The yeast used in their recipe is more fast-acting than the starter used in heartier sourdough breads, which can take days to complete from start to finish. 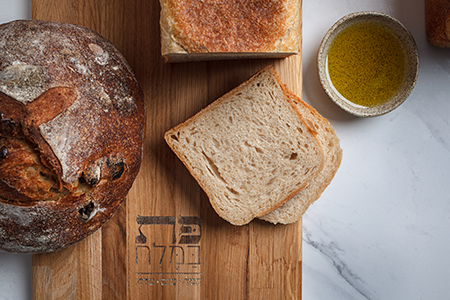 Since Shavuot is timed to the ancient wheat harvest (wheat being one of Israel’s seven species alongside barley, dates, pomegranates, olives, grapes and figs) it is fitting to make yeasted delights on this holiday—in addition to your favorite dairy dishes, of course! 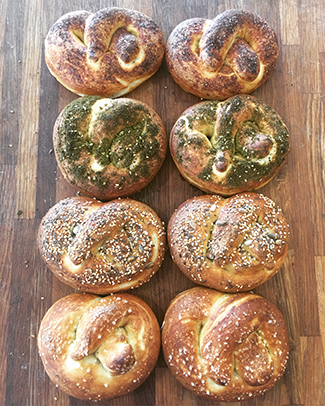 This holiday, try your hand at Pat BaMelach’s soft pretzels. Mix all ingredients on slow speed in a stand mixer for 3 minutes. Increase the speed until the dough is pulling away from the side of the bowl. Let dough sit for 45 minutes to 1 hour, to rise. Divide the dough into 20 pieces. Shape the individual pieces into your desired pretzels twists (there are great YouTube videos on how to shape a pretzel). With your finger, gently dab water on the top of the pretzel. Sprinkle the twists with your favorite seasonings: coarse salt, seeds, cinnamon sugar, za’atar. Let rise for 20 more minutes. Bake at 390 for 15-20 minutes, or until desired brown hue.